Purple reigns in terms of storytelling, character development and catharsis. With some musicals more than others, you feel at the end as if you've shared something very important with the audience along with the cast and creative team. You've been told a story, you've been entertained, you've been lifted and dropped and dragged all over the place. But it's that final sensation—catharsis—that you're seeking. 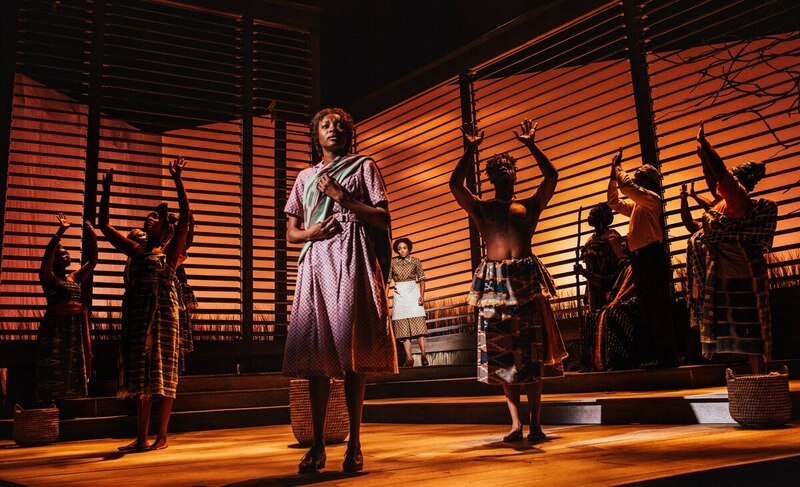 The Color Purple, now playing at Portland Center Stage at the Armory, offers that emotional fulfillment like few shows I've seen. For those unfamiliar, The Color Purple is the story of Celie (played by Felicia Boswell), a black woman living in rural Georgia during the early 20th century. We first meet her as a timid teenager who has already endured a lifetime's worth of physical, verbal and sexual abuse. A key early scene takes place on a darkened stage, a lonely beam of light pouring onto Celie as she's forced to give away her babies, not knowing where they're being taken or if she'll ever see them again. She sings "Somebody Gonna Love You," a tearful solo that goes, "Got nothin' to give you but a prayer/God's gonna see you through./To part with you more than I can bear/But somebody gonna love you." Boswell, an immensely talented singer, delivers the tender words with the utmost grace, inviting us to look into Celie's unbearable plight while also giving us a first glimpse at her resiliency. Boswell also deserves credit for her physical portrayal of a character we see evolve over the course of four decades. Obviously, the body, posture and gait of a character at age 14 will be much different from that character at age 50. The Steven Spielberg film adaptation had the benefit of frequent makeup changes and subtitles to tell the audience what year it was; here that's not necessary. We can track Celie's growth and mounting love for herself in the way she carries herself. While vocal performances from the entire ensemble are exceptional, two deserve to be singled out. Lana Gordon, as larger-than-life jazz singer Shug Avery, radiates star power yet remains shrouded in mystery. Her stripped-down version of "Too Beautiful for Words" is one of the show's highlights. Chaz Lamar Shepherd, who played the part of Harpo on Broadway, makes a fiery and compelling Mister and is forced to confront his lifetime of cruelty with a powerful solo at the end of "Celie's Curse." Music in The Color Purple draws from a range of influences, including jazz, gospel and blues, and is performed live by an eight-member orchestra consisting of two on keys, a two-member reed section, and one musician each on trumpet, bass, guitar and drums. The sound is richly textured and exactly the right size for the venue's main stage. Set design is intricate, although your initial impression might be monotony. The main feature appears to be the sides of two buildings next to each other—interlocking grids of gray and brown timber that could portray somewhere in town or somewhere on a farm. It's drab, and seems to have little to offer. As the show goes on, however, the set starts to reveal more and more of itself. One of my favorite scenes was the gorgeous, somewhat surreal sequence that opens the second act. "African Homeland" is a duet between Celie and her sister Nettie (Danea C. Osseni), who was taken away from her. Despite being a continent apart, they seem to be communicating with each other through song. The set opens and the sky turns a brilliant red as we see silhouettes of Celie's family walking toward her. The Color Purple is a challenging story—the tale of a woman who's had everything taken from her, and yet she's able to find ways to appreciate the beauty in life. It's a difficult story told with humor, heart and song. It's also the kind of story that feels like an emotional cleansing, and by the time Felicia Boswell kicks into the final show-stopping number, "I'm Here," you'll know why you came. Sept. 21 was opening night for The Color Purple and the official start of Portland Center Stage's 2018-19 season. It was also the first opening night for new artistic director Marissa Wolf. Wolf took over as head creative visionary from Chris Coleman, whose tenure marked the rise of PCS from ambitious local company to one of the most respected regional theaters in the country. Wolf, who previously served as associate artistic director at Kansas City Repertory Theatre, joins managing director Cynthia Fuhrman to lead Portland's largest professional theater operation. Calling her "a rising star of American theater," Oskar Eustis, artistic director of the Public Theater in New York, says Wolf's job is to be the one who "sets the vision, charts the course and figures out how the theater can best serve the community." Wolf says she spent much of her first days with PCS meeting the audience. "I've been on a bit of a listening tour," says Wolf. "I want to hear about experiences people have had here at the Armory." One of Wolf's crowning achievements at KC Rep was launching OriginKC: New Works Festival, a program dedicated to the development of new productions by major American playwrights. "We really are looking for the next Tennessee Williams or August Wilson," Wolf says. Fans should be excited about the 2019-20 season, which will be the first fully programmed by Wolf, and planning is already underway. She's thrilled to follow Coleman's legacy and expects there will be a similar balance of types of programming for which PCS is known—crowd-pleasing musicals mixed with challenging, contemporary drama and everything in between. SEE IT: The Color Purple is at Portland Center Stage at the Armory, 128 NW 11th Ave., pcs.org. 7:30 pm Tuesday, Wednesday, Friday; noon and 7:30 pm Thursday; 2 and 7:30 pm Saturday-Sunday, through Oct. 28. $25-$87.